Last night I dreamt I went to Jaipur again. This time though, not the Indian restaurant in Dublin, rather a stumbled-upon curry house in a quiet street in Nerja, an hour’s drive from Órgiva on the coast towards Málaga. This post isn’t about Nerja, although on first impressions it’s a nice place. There’s a buzz about it, the town’s busy and the beaches good. The sun shone on white-haired British expats who sat outside the bars; men in red trousers were spotted and there was even one of those tourist ‘trains’ with rubber tyres that trundled up and down. The Spanish barman spoke to us in English (this never happens in Órgiva, apart from Luisa at El Molino). Órgiva, bless its cotton socks, has shoe shops and hairdressers – while Nerja has a Lacoste. On the other hand, it apparently has at least three tattoo parlours for those seeking a Guns n’ Roses design on their upper arm – or one of those silly lizards on the shoulder. By not having a restaurant curry for several months, we’ve realised that part of our souls have departed. We actually dream about dhansak, dhal and channa marsala and no amount of home-cooking or foreign muck can take away the pleasure of eating a portion of paneer pakora followed by a fiery prawn dish or tandoori chicken. Clearly no experts on the curry houses of Nerja, we think we ‘chose’ a good one. We had the usual conversation – try this? that? – but settled on what we always have: two mains, two vegetable side dishes and rice. There was nothing to fault about the Chicken Dhansak, Tikka Marsala (both around €10), sag bhaji (€5) and dhal (€6.50). Even the poppodums with mint sauce and pickled onion were good. The traditional accompanying drink – a glass of rosé – suited the food and the waiter threw in a complimentary caramelo, half a litre of the stuff, it seemed. In our greedy rush to eat the food, we forgot to take pictures apart from the box the bill came in. But photographs of food usually look rubbish anyway – especially curry, which can look like vomit in a silver bowl. 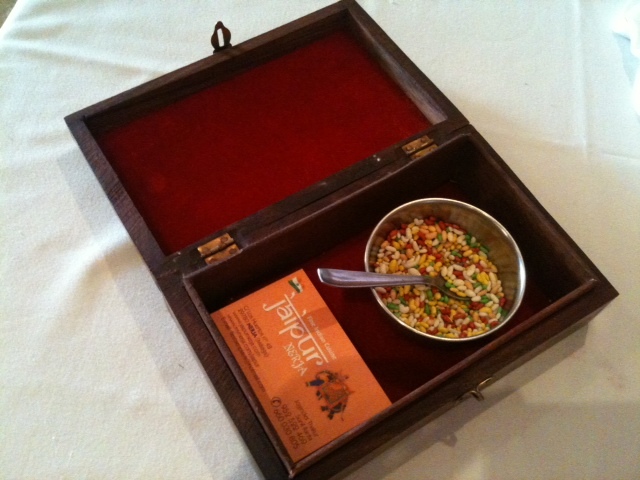 It was a rare treat, but Jairpur is thoroughly recommended. The staff – who speak Spanish, German and English (luckily for us) are fabulous – and it has clean loos. We’ve tried the curry house in Almuñécar up the coast and prefer this. 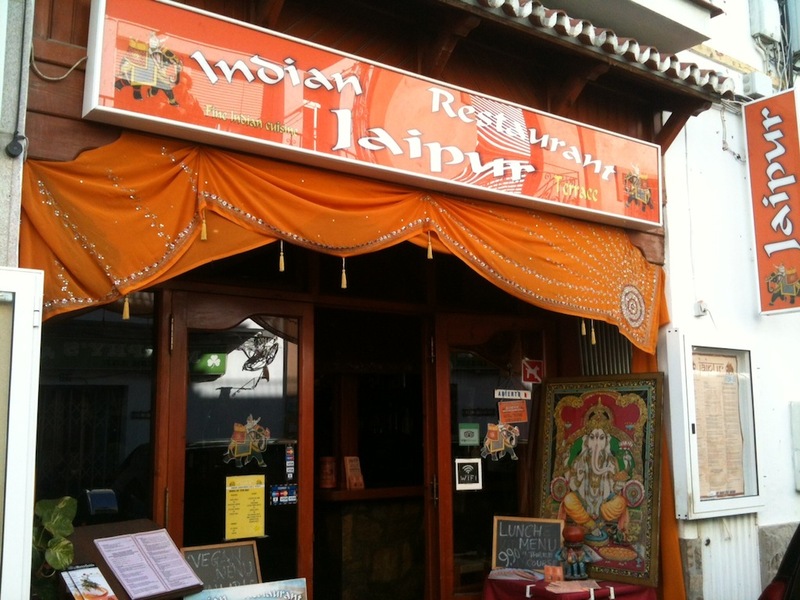 Jaipur: Calle Los Huertos 48, Nerja (open Monday and Tuesday, 6.30pm to midnight: Wednesday to Sunday, 1pm to 3.30pm and 6.30pm to midnight). Google map. Assuming it’s still there, Khan in Almunecar is slightly less of a trek. A bit nearer – a recommendation? You chose well 🙂 The Jaipur is certainly somewhere we have had a decent curry in Nerja. Other Indian restaurants include Light of India on Calle Carabeo and the Haveli on Calle Cristo – though to be honest I haven’t visited either of those two for several years. Nerja is a lovely town for couples and families – I suppose I end up there, on average, once a fortnight. Good choice of shops, a wide range of restaurants/tapas bars and a nice atmosphere. Could be mistaken but Haveli may have closed…. Hmmm … yes, you could be right. As I said, haven’t been there for a while. Actually, I went to Nerja today – so I had a look at the Haveli. Although it was closed this afternoon, it gave every sign of still being in full swing. There was a small notice in a side window saying that they are having a “relocation sale” – but strangely, it didn’t say where they were locating to – or when! Yes, good job you didn’t photograph the curry! Someone told me that Nerja is great for a family holiday if you’re new to Spain so it’s kind of on my list. Besides, I always wanted tats like Axl Rose … but maybe I can be restrained! S has a tattoo of Lemmy on her lower back and M one of Leslie Crowther on calf. Heroes. Never too late for a tattoo. Nerja should be on the list…and Órgiva of course! Are there others you recommend? does your friend give you an extra poppodum for free? I’m putting that on my list.